Is LinkedIn Branching Out Into Traditional Social Media? LinkedIn is one of the most popular social media sites among B2B and sales professionals. It has a more specific focus than the rest of social media in that it is focused more on things like helping people build a professional network that would allow them to get employed at some point in the future. However, one thing LinkedIn has always lagged behind is traditional social media touch. It was never really seen as a network where you could go to connect with your loved ones, and it generally tended to stay away from the more frivolous aspects of social media. That being said, an app researcher @wongmjane has recently noticed LinkedIn branching out into reactions, much like the reactions that are currently being implemented by Facebook. The reactions themselves were different from the ones Facebook offers, but they followed a similar format. Another feature that Cathy Wassell and MattNavarra ‏noticed was a stories feature, much like the one offered by Instagram and of course, the progenitor of this feature that is Snapchat. 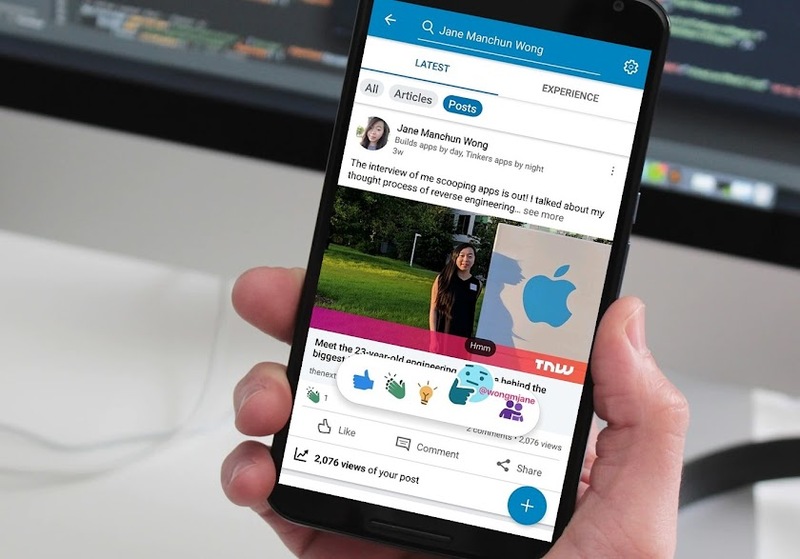 It is pretty obvious that LinkedIn is testing these features out to see how well they would work, but are not ready to introduce them to all users yet. LinkedIn might be thinking of a more mainstream approach which could spell big changes to the world of social media. Update: Isha Patel product manager at LinkedIn confirmed in an statement to TechCrunch blog that Linkedin is planning to launch the "Stories" format, but first they are introducing the “Student Voices” feature in the U.S. region just for university students.